Well now that I've drank my tea and cleared the table I use for photos, it's time to tell you about the splendid May offering from OHM Beads. Only 555 released worldwide, in 2 versions, 455 in a light silver oxidation and just 100 in a dark silver oxidation. Everyone, bead fans and retailers alike didn't know which version was in which box as they all came sealed in a space style package. Crazy stuff - my first Luna was one of the 100 Dark Lunas! After the beads starting arriving in their new homes, OHM Beads via Social Media said they would share a fun fact about the Dark Lunas if more than 10 people posted their Dark Luna pics. They revealed that EACH one of the 100 Dark Lunas is actually unique and truly one of a kind, as there are small differences in the craters on the surface, This was not only unexpected but really blew me away! I have to confess here, that secretly, I'd been hoping for one of the more common light silver Lunas. As genuinely excited as I was to have a dark Luna, I mean who doesn't love a rare Limited Edition, from wearing my jewellery everyday point of view, I knew I'd get more wear from the light silver version. Another collector pointed out I'd be swamped by people wanting to swap... however I really didn't want to let my Dark Luna go, just because I'd get more day to day wear from a light silver one, didn't mean I wanted to give up this one. However, now they were sold out everywhere! Here's where I got crazy lucky for the second time; a case of right time, right place. One online retailer hadn't taken pre-orders as they were away, and they came back after release day and had a few left. I checked, they were sold out (no surprise there) then they said they hadn't sold out, it was just their website uploading slowly! I ordered and I got one of the few remaining, now I was holding my breath for this to arrive in the hope it was a light silver one! ...however my regular postie realised this, and after an extensive discussion with my neighbour (I wasn't in), put the package through my door anyway - I owe that postie a few pints!! 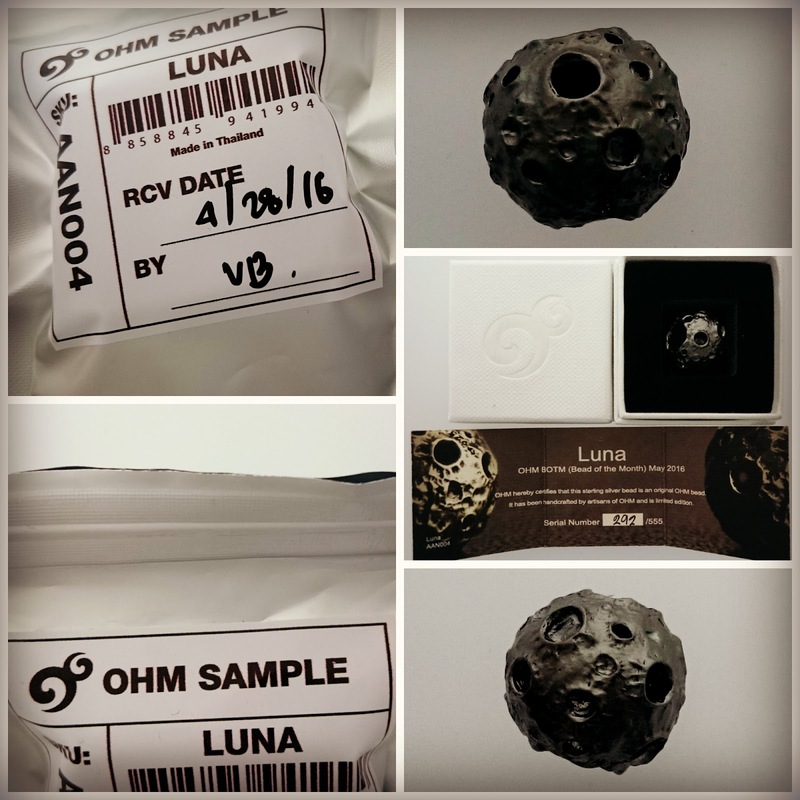 By now I knew that Dark Lunas came in white boxes, and Light Lunas came in black boxes... so opening up was just as exciting but also a bit tense; did I have a white or a black box inside my moon sample package? Yay it was a little black box with a lovely light silver oxidised Luna within! I really can't believe how lucky I've been with the whole Luna release, not only to have a dark one with my first order, but to find a second available after everywhere had sold out, for the postie to take a chance and for it to be silver too. Wow! I'm one very happy, very lucky Mars! So what did I do with them once I'd got them... Silver Luna went straight on to a necklace. 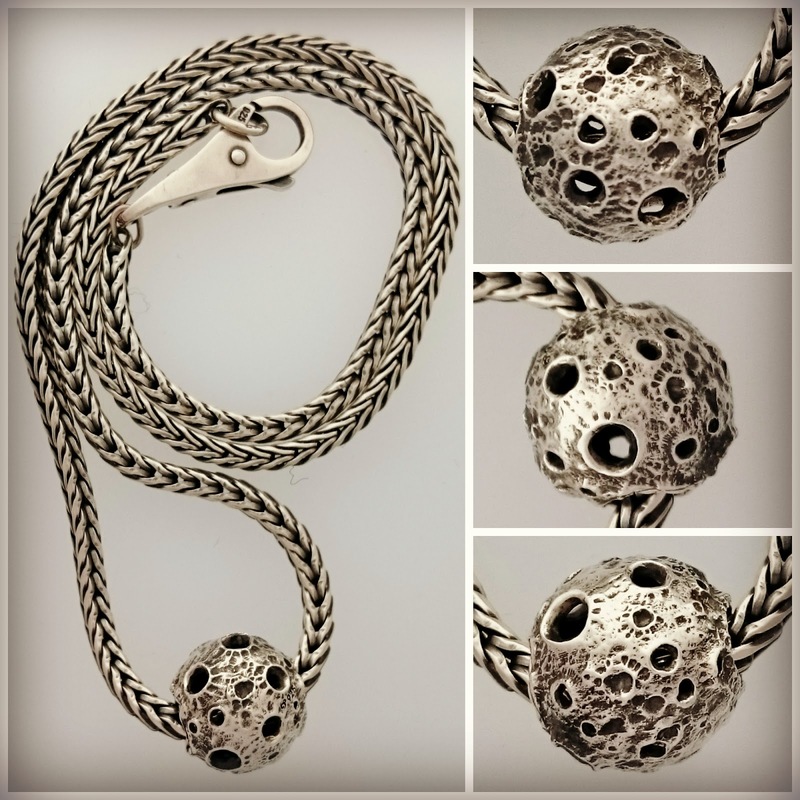 I love this bead, the detailing in the light oxidation is wonderful, and it may swing the balance to me ordering the OHM necklace that's designed so you can wear your RAWR skulls or your Luna bead vertically, as I think I would get a lot of use out of one - but as I'm spent up that'll have to wait for now. With the Dark Luna, I wasn't sure how to wear it at first. I tried several cominations using Trollbeads Fantasy Necklaces, but I wasn't 100% happy with how it was sitting (yep another vote for the OHM necklace) so I moved onto my bangles. My copper bangle was the first one to hand; I really like the contrast between the two metals. 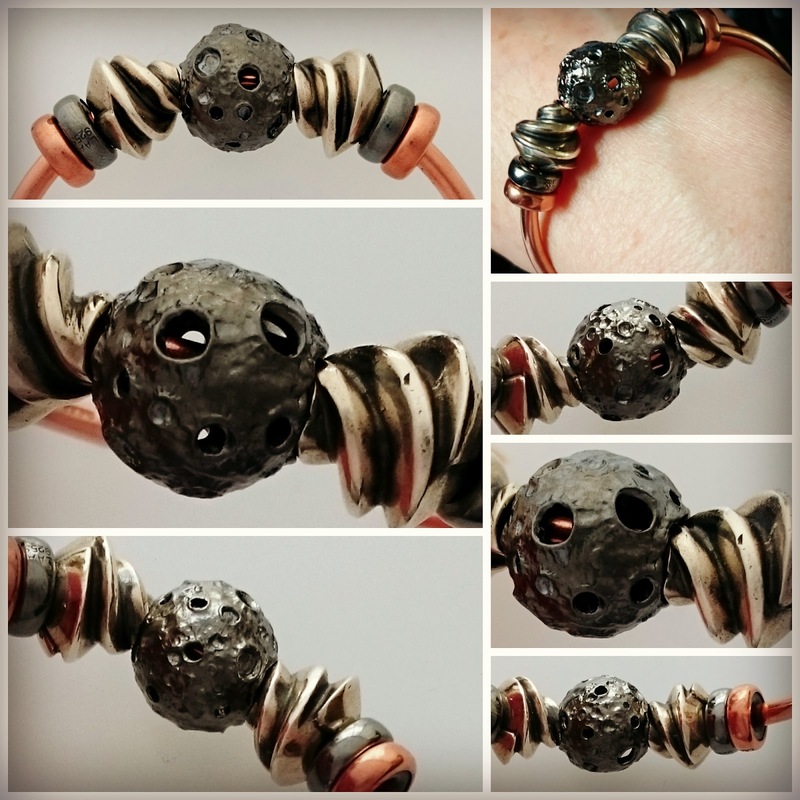 After dismantling a Fantasy Necklace to retrieve a pair of silver beads, I finished off with the new(ish) Trollbeads oxidised stoppers and voila! I think Dark Luna is better in real life than how it photographs sometimes, the pic on my wrist is more true to the colour and finish - as some of the other photos make it look a bit dull. So there you have it, two Luna beads, one of each, and a new bangle and necklace to wear, that'll do nicely! Which would you prefer; the light silver or the heavily oxidised LUNA? What do you think of the blind ordering method? That is awesome that you got one of each :) I really like the combo that you put together with the dark version. I kind of like the blind ordering method so that I wouldn't have to choose between the two :D But if I had to choose I probably would have chosen the lighter version too since I think I'd get more use out of it. I have the dark skull from Ohm and don't use it as much as I would like to. Thanks, I love the way the Mistrals (the silver beads) almost look like drills, or a vortex going into the dark luna... I think they're a great match! I loved the blind ordering method, I really like that it was exciting not knowing which one you had... although being super lucky on no.1 meant I ended up with two not one but hey, there are never too many beads right? Yes the Fates were certainly smiling upon you and what a truly, super Postie :) I do rather like the dark one - certainly it looks great in your photos of how you've put it on that copper bangle. Blind ordering seems like a good idea now and again and I like the special rarity value too - I never knew there was so much intrigue in the bead world!! Lol there's lots of intrigue in the bead world but no-one does it as coolly as the OHM team do. I really love this brand, I *adore* how they treat their customers and the fun they inject into buying beads. 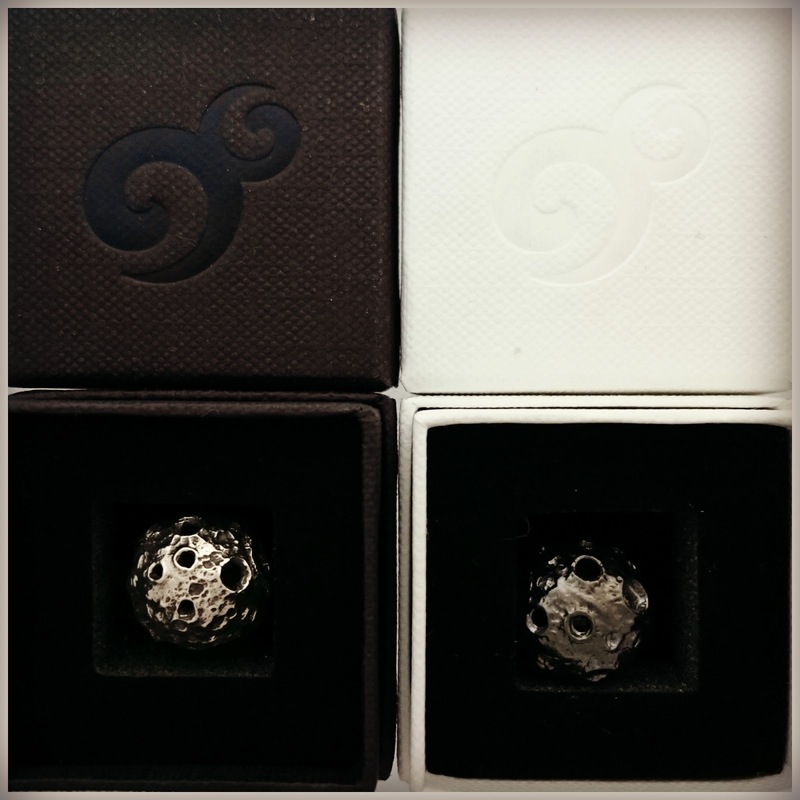 OHM are just up front about what a Limited Edition actually means, and the numbering of the Bead of the Month with the certificate is a beautiful touch. 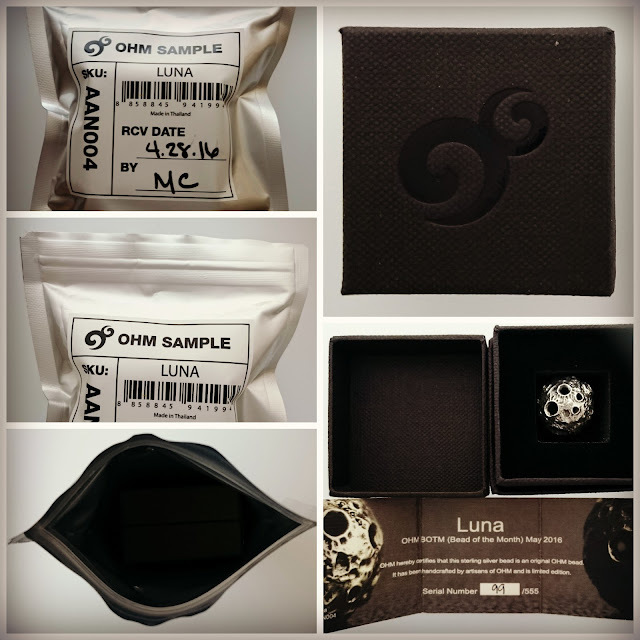 There's a lot of care that goes into things like the packaging, it's a Luna so it's space styled, on the last one I bought it was in a cage, with a feather and a wonderful braclet deal. ...and yes my postie is rather special! 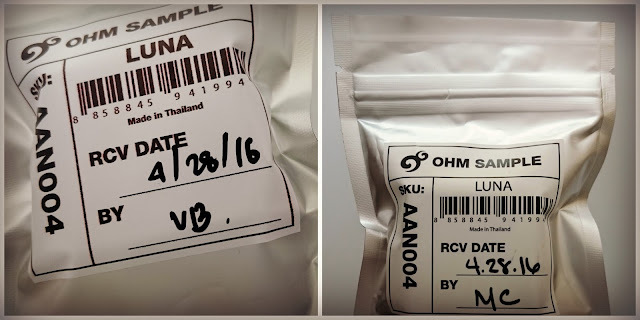 I discovered Ohm two weeks ago, too late to order Luna. I was lucky enough to find an online store with Mama Terra left, Do you happen to know of a store with a Luna? I'm afriad I don't know any, it was a very popular design on pre-orders alone - it's why I was so surprised I found one after the release date (that particular retailer sold out in minutes). I know a few people ordered extra, so they may appear preloved at some stage but I don't think there would be many. Now that you have found them, I'd say if you see any Bead of the Month that you love, pre-order as soon as you can! My friend Victoria over at Endangered Trolls is your best bet of keeping up with the latest Ohm (and other bead news) as she covers most of the brands and is nearly always first with the news, if you sign up for her site via email, then you'll always know what's coming up. Has your Mama Terra arrived yet, what do you think? It's not one I've chosen but I do love OHM, one of my favourite brands to watch, even if I only have a few beads, I just love what they do. They certainly are striking!!! They look like something from oute space! I got so carried away trying out combinations, I tried it with my Naughty Dragon and I feel a whole Pern bracelet coming on at some point, I could never get tired of this particular bead as there is so much scope! Who makes those 'mistral' beads? I've never seen them before. Excited to hear you're interested in making a Pern bracelet. There are so many great dragon-themed options! The mistrals are made by a friend of mine, so they are not readily available in any shops. Yes I haven't actually changed the bangle around yet, still wearing it like this!